Over the time, the users of Iris Garden has dwindled since it has failed to content its residents from the community. We were approached by the community to work with the residents on reinventing Iris Garden. The objective of this intervention is to encourage the residents to use the park for activities and exchanges. Invited by a broad visionary from Lundu, Sarawak, Borneo Laboratory proposed to build a pavilion by Pandan Beach for the local community. Through the cooperation with students from Taiwan, Borneo Laboratory and a tutor from Bartlett, we hope to irrigate this place with vital energy, alluring youngsters to come and participate in even more activities for the region. The project, as an environmental friendly statement, is composed of local leftover materials as well as resources gathered from the site itself, honouring and celebrating the beauty of nature. Through this pavilion design, we fulfilled the experiment of combining different crafting skills and traditional techniques with local craftsmen, creating an innovative result that will help to expand the horizon of traditional crafts for a further future achieving a shape and form that has never been seen before. During site analysis, we found various conditions of daily and season winds, such as the ocean breeze in a day to the strong wind blowing from the land at night. 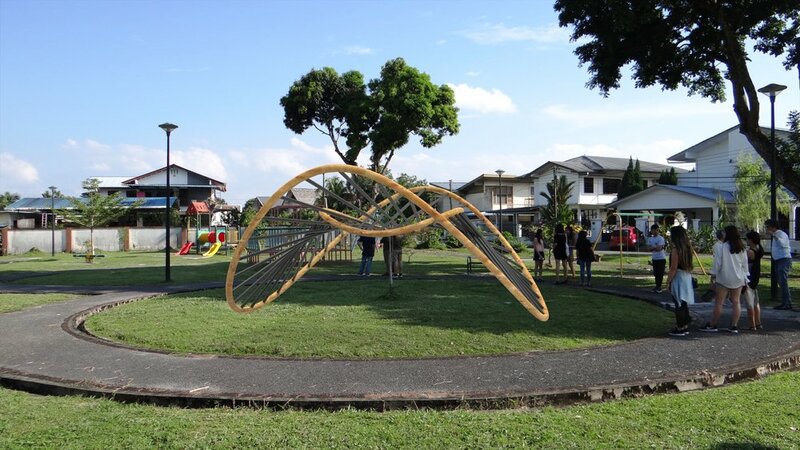 Therefore, one of the major challenges has been to solve the designing performance of the piece in Monsoon season, allowing the shelter to rotate freely moved according to the wind direction. International collaboration plays an important role in Module 3, it takes an European architect, a UK architect, Malaysian residents and 9 Taiwanese architecture students to collaborate. All kinds of foreign mindsets and knowledge from around the world create not only marvellous sparks but also awesome friendships. The project was developed combining two different constructions systems. The accurate and structurally sound bamboo and timber tied system and the flexible and seducing vegetable weaved patterns. The coconut, the rattan, the atap, and the ropes made of ivy were collected directly from the site creating different effects of shading and movement. The design process relied it’s successful outcome in the multiple prototyping and design iterations developed in order to improve the structural and usability logic of the shelter.